If you struggle with a sunscreen allergy, finding the right sun protection measures can be difficult. 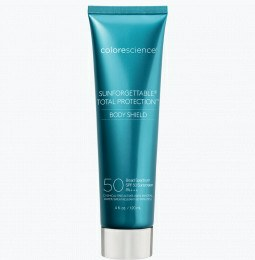 Colorescience is dedicated to creating sunscreen products that are suited to every skin type and designed to help you spend time outside without worrying about burn or irritation. What Does It Mean To Have A Sunscreen Allergy? You probably understand the risks and consequences related to sunburns and sun damage, but those with sunscreen allergies find it much more difficult to combat the sun’s rays and enjoy their time outdoors. That’s because most brand-name sunscreens are “chemical”, which means they work by absorbing UV rays and converting them to heat. These strong chemical ingredients can cause allergic reactions in certain skin types. If your sensitive skin is prone to allergic reactions, you need allergy free sunscreen in the form of safe mineral powder. 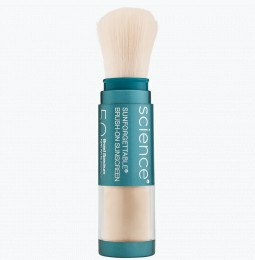 Mineral sunscreen for allergic skin rests on the outer layer of epidermis—rather than absorbed internally—to refract UV rays, so you can safely protect your complexion without all those harsh chemicals. What Does A Sunscreen Allergy Look Like? CA sunscreen allergy may appear in one of two ways: contact allergy or contact photoallergy. If you have a contact allergy, the allergic reaction will occur anywhere the sunscreen is applied. If you have a contact photoallergy, the allergic reaction will only occur in areas where the sunscreen was applied once exposed to sunshine. Common signs of a sunscreen allergy include swelling, itching, burning, and redness. Both of these reactions occur due to irritating ingredients, fragrances, parabens, and/or PABA. 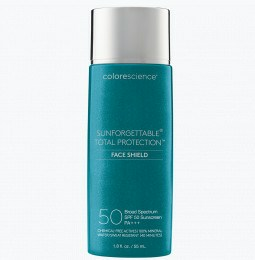 Colorescience offers biodegradable sunscreen that’s as safe for your skin as it is for the environment. Because if you wouldn’t want those chemicals in a landfill, you probably don’t want them absorbed into your skin, right? 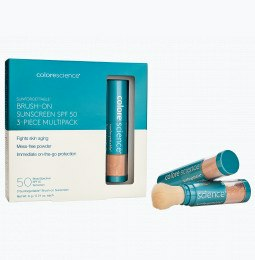 Does Colorescience Offer Sunscreens For Those With Sensitive Skin? Of course! Our gentle sunscreen for allergic skin won’t trigger flare-ups due to contact allergy or contact photoallergy. Now you can protect your skin from the sun without suffering through blotchy redness and itching. Colorescience entire line of cosmetics and skincare uses only the best ingredients for the safest formulas. Whether you’re looking for the best lip gloss for sensitive skin or non-irritating SPF protection, you’ll find it here within our assortment of mineral makeup. I bought one at a doctor's office. I loved it. Shared it with my kids when we leave the house. I bought 3 more with their promo price.. I am hooked. #1 LOVE that I now have a Sunscreen product I can use on my Grandbabies that isn't full of chemicals! AND that they are happy to stand still while it is applied. #2 LOVE that I can use a sunscreen on my face without all the chemicals! #3 Hubby has a cute bald head that can now be totally protected with an application that he can reapply in just seconds ! #4 The athletes in the family LOVE that they can use it on their face without it burning their eyes as they sweat! And, that it can be reapplied without getting their hands all 'gooped up'. #5 IT WORKS!!! We live in the Sun and this is the best sunscreen we've ever used. I have sensitivity to Vitamin E. No problem with this mister and I use it throughout the day to give my skin a drink of water! My absolute favorite facial sunscreen! I love this sunscreen! It goes on smoothly, has no scent, and I can’t even tell it is there after a few minutes. There is no whitening of my skin. As a hiker, skier, and paddle boarder, I love that it does not sting my eyes. 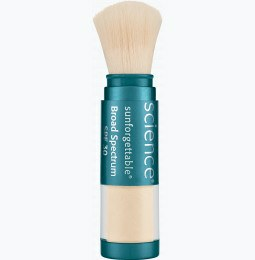 I also love that I can touch it up with the SPF 50 brush throughout the day.